The newly inaugurated president, who openly admires Brazil's previous military dictatorship, promised to adhere to democratic norms. Brazil's newly inaugurated President Jair Bolsonaro said on Tuesday his election had freed the country from "socialism and political correctness," and he vowed to tackle corruption, crime and economic mismanagement in Latin America's largest nation. Bolsonaro, a former army captain turned lawmaker who openly admires Brazil's 1964-1985 military dictatorship, promised in his first remarks as president to adhere to democratic norms, after his tirades against the media and political opponents had stirred unease. While investors hope Bolsonaro's free-market stance will reinvigorate Brazil's economy - the eight largest in the world - environmentalists and rights groups are worried he will roll back protections for the Amazon rain forest and loosen gun controls in a country that already has the world's highest number of murders. "This is the beginning of Brazil's liberation from socialism, political correctness and a bloated state," Bolsonaro, 63, said in an address to the nation made after he donned the presidential sash. A seven-term congressman who spent decades on the fringes of Brazilian politics, Bolsonaro was swept to power in October by voters' outrage with traditional political parties, making him Brazil's first right-wing president since the dictatorship. Voters punished mainstream parties following more than four years of graft investigations that laid bare the largest political corruption scheme ever discovered. Centrist parties were trounced, reshaping Brazil's political landscape and polarizing Congress. Following a knife attack during the presidential campaign that left Bolsonaro hospitalized for weeks, security was tight for his inauguration. Some 10,000 police officers and soldiers were deployed on the streets of Brasilia, the capital, as Bolsonaro and his wife rode in an open-topped Rolls-Royce to Congress. His voters are now impatient for Bolsonaro to make good on ambitious promises to tackle graft and violent crime and revive an economy still sputtering after the collapse of a commodities boom led to Brazil's worst recession on record. As thousands of supporters, many with the Brazilian flag draped around their shoulders, chanted "the captain has arrived!," Bolsonaro launched into a fiery speech. "We have the great challenge of taking on the effects of an economic crisis, of facing the distortion of human rights and the breakdown of the family," he said. "We must urgently end ideologies that defend criminals and penalize police." 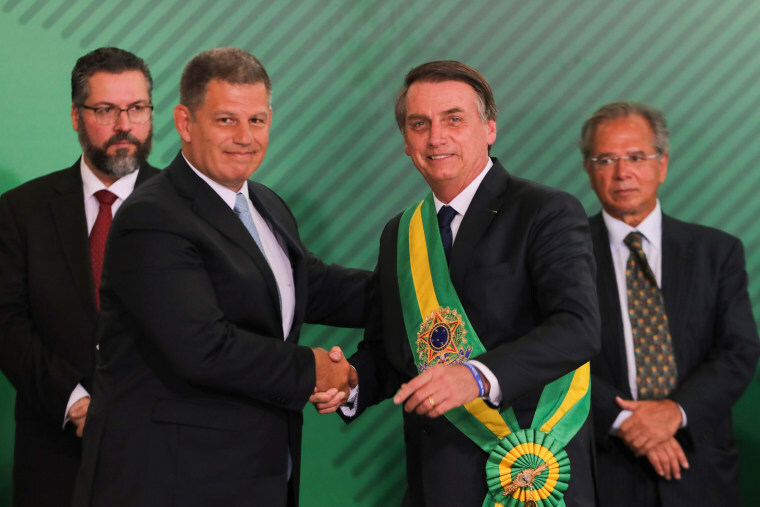 Bolsonaro, who was sworn in before a joint session of Congress, called on lawmakers to help him "free the nation definitively from the yoke of corruption, crime, economic irresponsibility and ideological submission." Bolsonaro plans to realign Brazil internationally, moving away from developing-nation allies and closer to the policies of Western leaders, particularly U.S. President Donald Trump, who sent Secretary of State Mike Pompeo to his inauguration. Trump congratulated Bolsonaro in a Twitter message, writing "The USA is with you." One-third of his Cabinet are former army officers, mostly fellow cadets at the Black Needles academy, Brazil's West Point, all outspoken backers of the former military regime. In an interview with Record TV on the eve of his inauguration, Bolsonaro lashed out at Brazil's notorious bureaucracy, which makes doing business difficult and expensive. He vowed to strip away the so-called "Brazil Cost" that hamstrings private enterprise. Bolsonaro's vow to follow Trump's example and pull Brazil out of the Paris climate change agreement has worried environmentalists. So have his plans to build hydroelectric dams in the Amazon and open up to mining the reservations of indigenous peoples who are seen as the last custodians of the world's biggest forest. That would help restore order to government finances. The key measure, however, for reducing the deficit and stopping a dangerous rise of Brazil's public debt will be the overhaul of the costly social security system. Pension reform will be Bolsonaro's biggest challenge since he has yet to build a base in Congress, where he has eschewed the political horse-trading that traditionally helped Brazilian presidents govern the nation of nearly 210 million people.